which includes a plexi top/bottom sandwich. they should be robust. but a 3d printed thing for the DIY circuit would be great! I was thinking about this last night after reading through the monome ecosystem thread. I’m wondering if it’d be possible to make a, say, 3 in -> 3 out (or whatever I/O count makes sense) USB power/switch that is addressable by i2c. My thoughts are that It’d be very cool if you could trigger a change of grid connection from say, a Teletype to an Ansible with a trigger to Teletype. I think this could possibly be an interesting way of controlling your ecosystem in a very Monome way. In practice, I’m thinking it’d be cool if you could control LFOs with cycles, then cause a trigger to switch the arc to controlling some other thing (maybe some future arc + teletype turtle app :)? ), then trigger again to switch back to cycles once you’ve done whatever you need to do with the other app. I have 2 spare Offworld-2 boards (as per the first post of this thread) in the UK. If anyone in UK/EU wants one I can post it if they send me a few quid on paypal. Put together one of these and works like a charm despite my dodgy soldering. Awesome, I would definitely be interested in a case! Apologies for the silly question, but would this allow me to use my grid with tt? I’m not up to date on the power side of things in relation to grid/tt integration. Yes. Works great for me. Other options are the offworld 1, Switch or ext 5v. Thanks! You don’t still happen to have a couple of those boards hanging around, by any chance? Nope sorry cocco88 snagged them! I’ve been using mine with my grid and teletype running @scanner_darkly’s beta grid firmware. It is absolutely fantastic! Brand new to the Monome world and have just acquired a Meadowphysics with my Grid and I’m getting buzz although my case seems to have enough power. That said, ideally I’d like to pick up an Offworld-1, Switch, ext5v. 1.) Someone here has some/one available to sell or is open to building one etc - where I can send PCB boards to. (happy to pay). 2.) I somehow learn to build this. I have no experience at all but in general it looks simple - any suggestions on where I can figure this out? I’m based in Brooklyn, if that helps in any way. Perhaps someone is local that I can use to help build this. Apologies for the total newbie question etc but hoping I can find a way to get a proper external power here. Here’s an option: I recently got a Grid and hacked the included cable in half and spliced in another USB A end to make a Y cable. 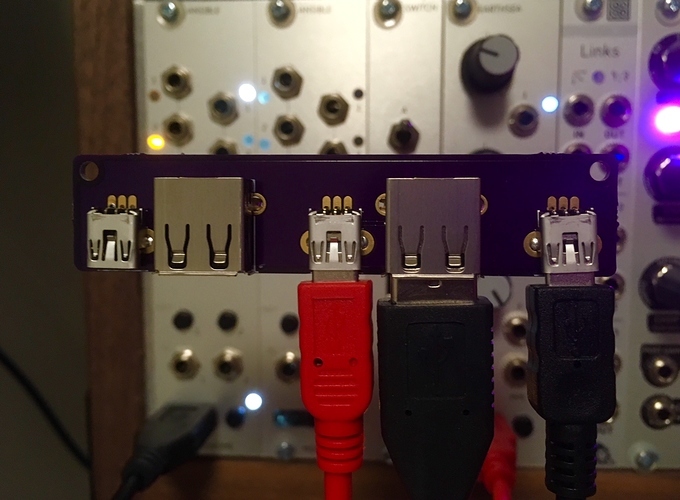 One USB A end only has power lines running to the Mini USB end, the other USB A end has only the data lines running to the Mini USB. Shields all connected. Then I connected the power end to a USB charger brick. Took about 30 minutes but only because I was precious with the heat shrink and soldering. Parts were scrap I had on hand. The Offworld board looks great but there’s no need for such a thing when scrap USB cables are literally bursting from my drawers. Give it a shot! This solved my noise issues when used with my ext5v. I had a grid kit with LEDs that took too much power draw, having an ext5v with a sufficient amount of 5v power helped. If it’s a kit and you’re handy you can swap the R3 and R4 with a 2.2k or 5k resistor (mine had 1.5 i want to say for some reason). I actually went to a local shop and picked up a “USB Sharing Y-Cable 2 A Male to A Female”, thinking I could do the hack others have mentioned. When I plugged this in, it simply just worked, without any further adjustments. Tried the cheater plug initially but still had the same results/buzz. do you have a link to the product that “just worked”? Just found it on Google via the product number sticker being PC Cables - 70650. I did need to buy a simple USB extension on top of this as well, since the Y cable is very short. got it. so while this “works” it’s not ideal-- both the module and the “power” connector are powering the grid. which means they are both pushing power onto the line, which could create problems (ie, blow up stuff) if the two sources are putting out slightly different voltages. i would not trust this for long. i would suggest doing the cable surgery (cut the power line on the data+power line) immediately.